The DocLogix Customer Claims Management solution is dedicated to one thing – efficient and automatic claims management for manufacturing companies. It is the most flexible and powerful way to manage all types of claim, from warranty and post-warranty maintenance to product claims. This solution helps to solve problems such as lateness in answering claims (which leads to lost clients and more claims about poor service), lost information about claims and disorganised documentation, and aids the overall quality of processes involved in manufacturing claims management. This solution is best suited to manufacturing companies that specialise in a project manufacturing, produce large, expensive, specialised products, and want to better manage their claims, create strict procedures for claims management, and maintain the best possible relationships with their customers. AUTOMATIC CLAIMS MANAGEMENT – efficient, continuous and precise internal processing of customer claims. FAST ACCESS TO INFORMATION AND DOCUMENTATION – all information and documentation about the claim will be stored in a standardised form (claim card) in one place: the DocLogix system. Better VISIBILITY OF THE CLAIMS FULFILMENT PROCESS – you will be able to share claims request records for all relevant employees, as well as see which stage of processing a claim has reached and which stages it has gone through so far. Better MANAGEMENT OF CUSTOMER EXPECTATIONS and REDUCTION OF CUSTOMER DISSATISFACTION. Better TRACEABILITY – you will be able to track performance and changes made to a claim, and access all the most important information, such as the employee appointed with regard to investigation of the claim, the due date and internal priority. IMPROVEMENT OF THE OVERALL QUALITY of work of the whole company, and of production processes and risk management – you will be able to track and analyse response processes for claims, such as the time of an official response and the delivery time for a final resolution for the claim. This solution helps you to REDUCE CURRENT LOSSES that occur through poor claims management. 40% reduction in claims-handling cycle time. 15% reduction in claims leakage. 60% improvement in claims processing. Ability to create an automatic workflow for claim fulfilment. A unified and easily accessible database of records for claims. Ability to create a claim card with standardised information. Ability to create a catalogue of different types of claim and a strict response protocol. Information submission at the metadata level. Registration of claims directly on the DocLogix system. Convenient search function with respect to claims. Ability to carry out evaluations of vendors/subcontractors on the basis of registered vendor/subcontractor complaints. Opportunity to set up relations with other business objects in other DocLogix solutions. For example, between customer claims and risks that could occur within a company. Multidimensional analysis of claims, such as time effort reporting for the investigation and/or resolution of a claim, the classification of claims, and the final status of claims (approved/rejected, processing/finished). Customers’ claim relation with specific work order or project. Calculation of external (from customers) and internal (to vendors) business process indicators for claims by quantity and value. 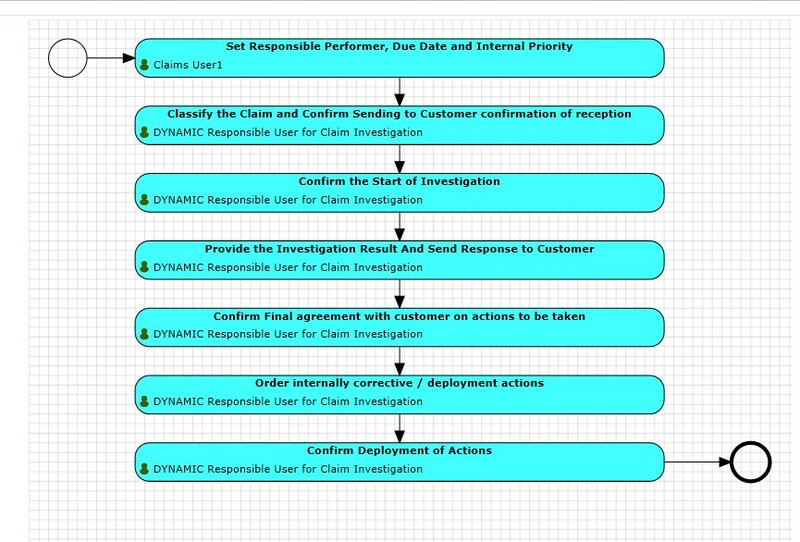 For each claim, a workflow routine will be applied that exactly mirrors how a customer complaint is processed inside the manufacturing company, including assigning a responsible employee, due dates, priorities, the investigation stages for a claim, communications to customers, and the carrying out of corrective actions. All responsible employees will be notified by email. The system will track the status of tasks and send reminders of corrective actions and/or notifications if a task is about to become overdue.